Yesterday we drove along the Skyline Drive and did a hike from it. 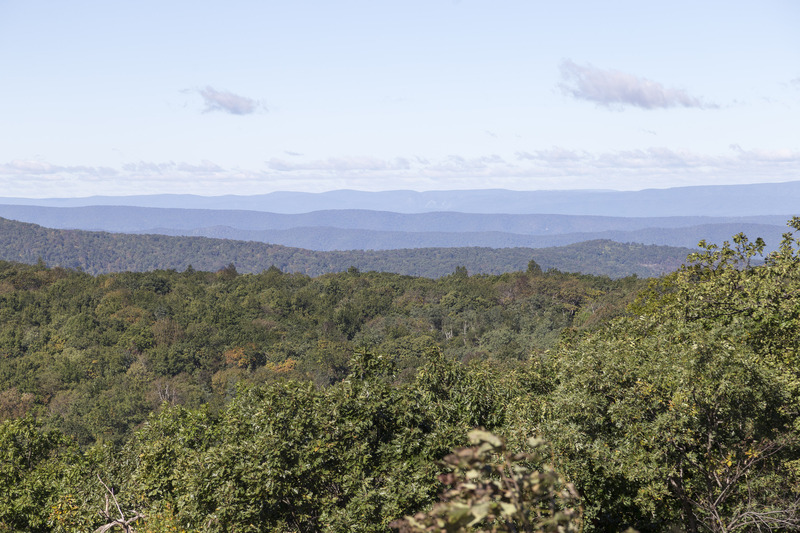 For those that don’t know it, it’s a road along the top – or near the top – of the northern Blue Ridge mountains. The road is just over 100 miles long and has just four entrances – the two at the northern and southern ends and two exits at traditional crossing points where highways cross the mountains. These two crossing points are known to date back to pre-European times, as the native Americans had trails across the mountains at these points. The road also reaches quite a height – a couple of points along it are at 3,500 feet above sea level, so higher than any ground in England (though not the UK, of course). There’s a general speed limit of 35mph along it, so driving along it will inevitable take a while. We just drove half-way along the Drive, stopped a few times to enjoy the views, did a hike, had a cup of tea (well, sort of) and a sandwich at the Big Meadow restaurant, and then turned round and went back to Front Royal. That doesn’t sound much but we were away from the B&B where we were staying for over seven hours. So it was a pretty full day. Two of those hours were spent doing the hike. We got some advice from a ranger at the Skyland visitor centre. We said we wanted a walk of not more than about 4 miles that visited a waterfall, and he recommended one that visited the Rose River and Dark Hollow falls, which was about 4 miles for the round trip. That sounded alright, we agreed. What we’d forgotten was that the hike also involved a lot of descent from the road to get down to the falls along quite steep and stony paths. Still not a problem. But – if you’re doing a circular walk then each descent must be matched by an equal ascent, and it might be that this had slipped our minds. So the first third or so of the hike was great – downhill all the way – but the next section, from Rose River falls to Dark Hollow falls, was very hard work. Then it finished with a long but steady ascent along a fire road which was at least easy underfoot. We were both pretty shattered when we got back to the car. I gather that the total drop was ‘only’ 720 feet, but when you’re not used to those climbs it was hard. All that said, the effort was worth it. The waterfalls on the flanks of the Blue Ridge mountains are very beautiful, and we got to see a couple of them. But we were pleased when it ended.